About 14 months ago, in last line of the first post on this blog, I mentioned that I was getting back into amateur sports full-time through a startup company I had founded. That company, Fungo Media, Inc. has just launched it’s first product: GameChanger. GameChanger provides mobile apps and web tools that collect, manage and distribute live streaming game data for youth, high school and college sports. 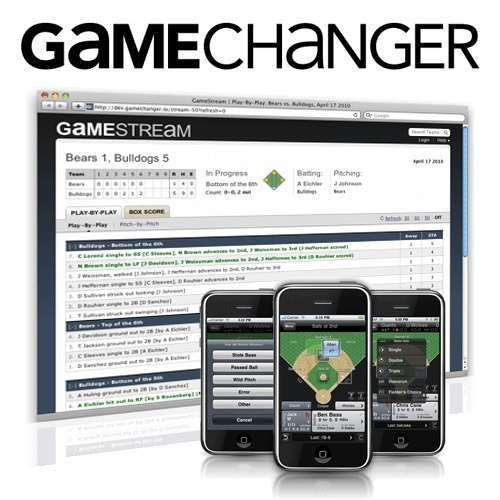 Beginning with baseball and softball, the free GameChanger iPhone app lets coaches and scorekeepers simultaneously score a game and generate dozens of stats in real-time, eliminating tedious post-game calculations. As each play is scored, the GameChanger online tools deliver a live play-by-play “GameStream” to the web browsers and mobile phones of parents and fans — or to real-time scoreboard “widgets” hosted on the websites of local news outlets, leagues, tournaments, travel teams and schools. I’ve written a blog post about the company, the team and our mission that includes a short video of GameChanger in action. Please follow our progress on Twitter, Facebook and on the GameChanger Blog. First trip to the new Yankee Stadium!… ho-hum. I made my first trip to the new Yankee Stadium yesterday for the Yanks / Orioles afternoon game and thought I’d write a short review. 2) I grew up watching the Orioles at Camden Yards and was at Fenway only a couple weeks ago so my bar is set pretty high. 3) That being said, I have no right to review MLB stadiums (or even calling myself a baseball fan) because I’ve never been to Wrigley Field. I know, I know… I’ll get there. Enough already. Anyway, the “new” Yankee Stadium is structurally very similar to The House that Ruth Built (not necessarily a good thing) but with none of the history. The old stadium had the ghosts of Ruth, Mantle and Maris so it didn’t need a Green Monster (Boston), a big Brick Warehouse (Baltimore) or a pool in the outfield (Arizona). The designers also eliminated the tunnels from the concourse so you can’t get that feeling we all love of coming out from the darkness and seeing the field for the first time. The place is huge. Granted, it’s New York City and they are the Yankees, and ticket revenue isn’t going into my pocket, but just under 52,000 seats is too many for a baseball stadium. Lastly, there are also some obstructed view seats in the outfield bleachers which is unacceptable for a new ballpark in my opinion. The high def scoreboard is ridiculous. Absolutely enormous and amazing quality. But unfortunately the sound system doesn’t match it’s quality. I was in the outfield bleachers and could barely hear anything. Maybe PA announcer Bob Sheppard just needs to turn up the volume. There has been all kinds of press about the super-high prices of the box seats. I wasn’t sitting anywhere close to them but there were plenty of empty seasts around home plate on a beautiful day when the Yanks are on fire and just took over first place. The most expensive seats are about 2500 bucks. This seems crazy to me but I know the Yankees aren’t the only guilty ones here. The comfy first few rows behind the plate at the National’s new stadium in DC could use a few more rear-ends too. Whatever “character” is lost in the stadium is gained back with the fans. Love ’em or hate ’em, the Yankee fans make themselves known. During the top of the first inning the right field fans chant each Yankees defensive player’s name in unison until they get a wave of the glove or a tip of the hat. And every player gives a wave when called. But as the alcohol flows some fans begin to cross the line. We sat right behind the Orioles bullpen and after about the 5th inning (and third beer) if any of the pitchers or catchers showed their face they would get absolutely abused by the pinstriped drunks in the bleachers. It’s a shame that the team and the city spent $1.3 billion for a place that really lacks personality. I’m looking forward to heading to Queens and checking out Citi Field. But if I want to see games in October it looks like I’ll be heading back to the Bronx.